You can customize your video player in a number of ways. Setting the autoplay mode. For example, use on-scroll to cause the video to start playing when more than half the player is visible on screen. Setting a specific image as the video poster, including applying image transformations on the specified image. Adding a floating player when less than half the player becomes visible on screen. This can be set to appear in the bottom left or right and includes a button to close. Defining the preferred set of video formats. By default the video format set is mp4, ogg, and webm, where the player selects the best format to play based on the browser in which the player is running. The above are just a few common options. For details on all available options, see the Video Player configuration options section in the Video Player API Reference. Additionally, see index.html in the sample CodePen for an implementation example with many of these configuration settings. Most standard HTML5 video attributes (autoplay, loop, preload, muted, etc) retain their standard default behavior (auto mode for preload and false for all others). By default, the video player automatically uses the middle image of your video as a poster image (the equivalent of <cloud_name>/video/<type>/<videoID>.jpg). You can specify a different public ID and/or image transformations using the posterOptions (data-cld-poster-options) setting. Additionally, by default, when the player requests your video, it will automatically request the best format from the default source types (.webm, .ogg, and .mp4). If the transformation defined already exists for the requested source type, it's delivered. Otherwise, the relevant transformation is transcoded and streamed in real time. You can override the default format options using the sourceTypes (data-cld-source-types) setting. In general, if you set the same configuration parameter for a specific video source, those values override the values of the parallel setting for the player. However, if transformations are defined for both the source and the player, the transformation definitions are merged. For example, you could define width, height, and text overlay transformations at the player level, and then apply some special effect transformations for a particular video source. The resulting video will include all of the above transformations. The cloudinary autoPlayMode (data-cld-autoplay-mode) is similar to the standard HTML5 autoplay parameter, but includes additional possible values. You should not include both settings in your player, but if you do, the Cloudinary autoplay mode setting takes precedence. The title and subtitle is displayed at the top of the video player whenever the controls are displayed. The title is displayed on the playlist thumbnails in the playlist widget or 'Next up' preview. The title, subtitle, and description are displayed for the primary video recommendation when recommendations are enabled. The title is displayed for the remaining recommendations. If a title is not defined for any of the above, the video's public ID is used instead. If a subtitle or description is not defined, those elements are not displayed. 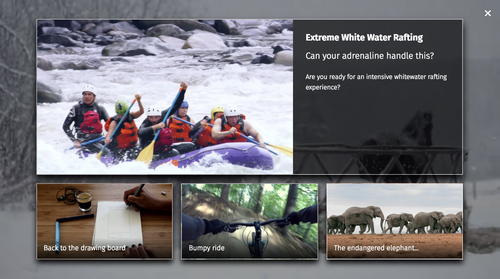 For example, the recommendation pane below shows the title, subtitle, and description of the main recommendation video, and titles for the remaining recommendations. You can add titles, subtitles, and descriptions directly to the video resources in your account by adding them to the resource context using the Upload or Context methods of the Upload API or via the Media Library. If the info parameter is set for a source, its values override the parallel entries in the resource context. The Cloudinary video player is built over the VideoJS player, v7. You can access all underlying capabilities of the VideoJS API, using the videoPlayer.videojs.default property. In previous versions of the Cloudinary Video Player, you accessed the VideoJS API with videoPlayer.videojs. Due to changes in the VideoJS API, you must now update these references to videoPlayer.videojs.default. For details, see the VideoJS Player API documentation.